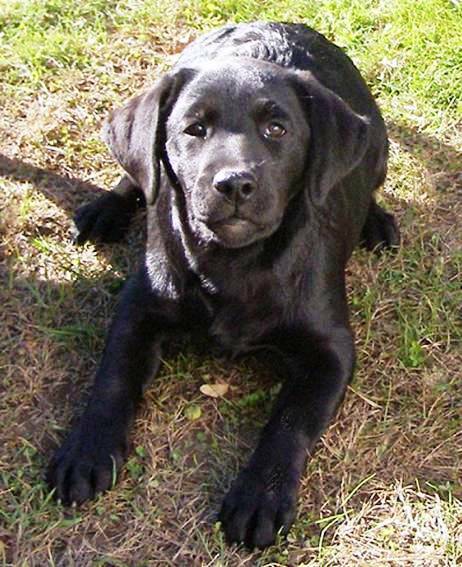 River is a sweet boy who loves being around people as well as playing with the other dogs. He is energetic (without being exhausting), and learns very quickly. 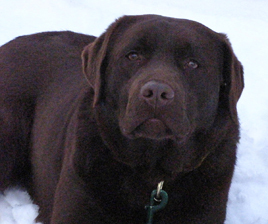 He is also a great companion, loving to stay close by my side. River is now an AKC champion. We are so proud of this boy and thankful to Sarah Crepeau for showing him so beautifully. Winners Dog/Best of Winners and "New Champion" from Open Black Class, New Brunswick Kennel Club, March 21, 2014 under Judge Frank Kane and handled by Sarah Crepeau. 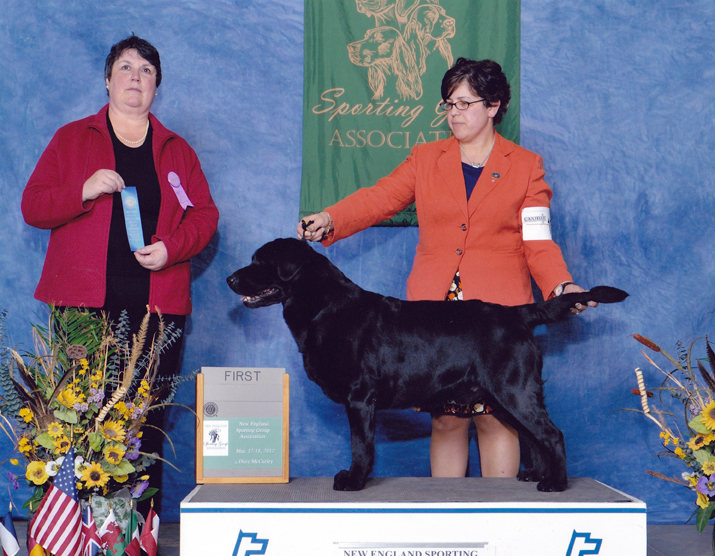 Reserve Winners Dog from Open Black Class, New England Sporting Dog Specialty, March 15, 2014, under breeder Judge Ms. Jodi Martin (Carriage Hill) and handled by Sarah Crepeau. 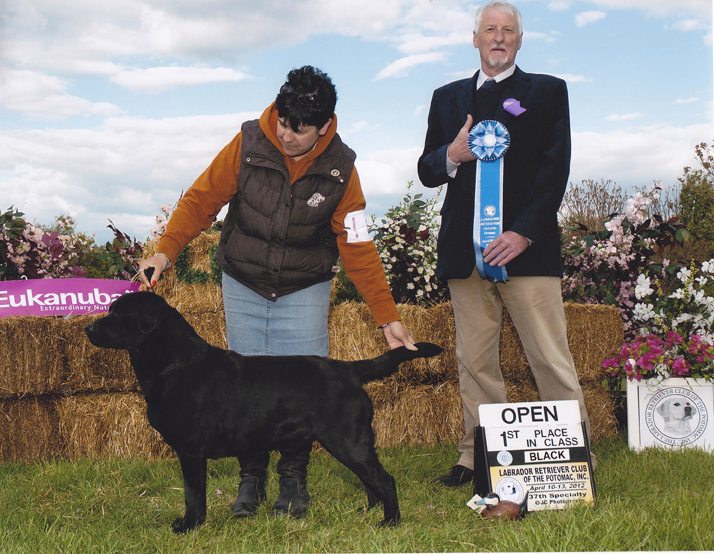 Second Place in Open Black Class, Pawcatuck River Labrador Retriever Specialty, September 20, 2013, under breeder Judge Phillipe Lammens (Misty Dreams) and handled by Sarah Crepeau. 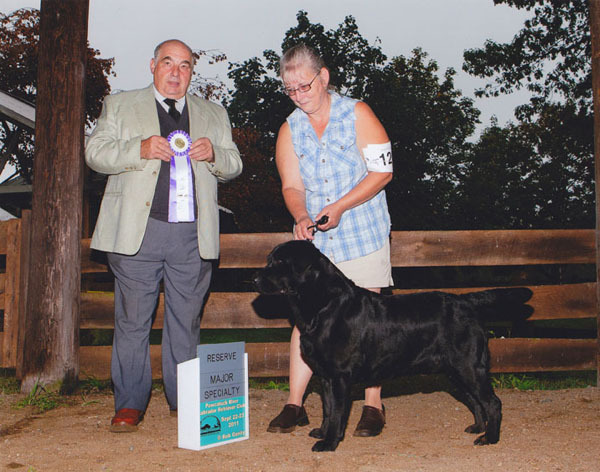 Second Place in Open Black Class, Pawcatuck River Labrador Retriever Specialty, September 19, 2013 under breeder Judge Barbara Nowak (Broyhill) and handled by Sarah Crepeau. 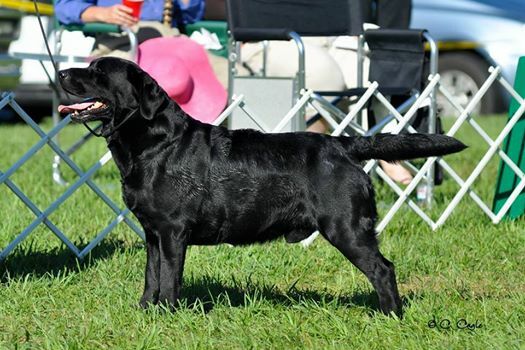 Second Place in Open Black Class, Labrador Retreiver Club of Greater Boston Specialty, June 13, 2013 under breeder Judge Carole Coode, (Warringah) and handled by Sarah Crepeau. Critique: Very sound mover. Not quite the length of muzzle as Dog #1 and shorter in back skull. Good neck, and lay of shoulder; upper arm could have a little more length and angulation. Well made through the ribs and body. Super rear end with good bone and feet. In good coat. 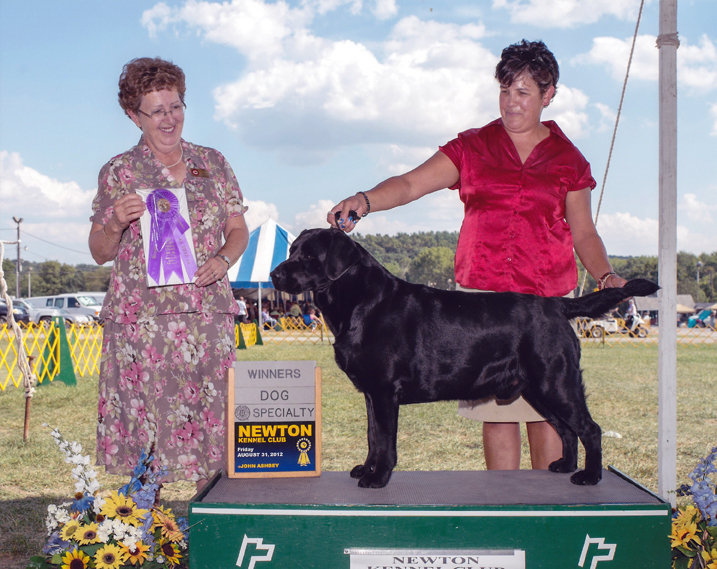 Winners Dog from Open Black Class, Jersey Skylands Labrador Retreiver Club Specialty, August 31, 2012 under breeder Judge Mrs. Patricia Lanctot (Ebonylane) and handled by Jen Leitao. Winners Dog, Best of Winners and Best of Breed from Open Black Class, Newton Kennel Club, August 25, 2012 under Judge Mrs. Paula Nykiel and handled by Jen Leitao. Winners Dog, Best of Winners and Best of Breed from Open Black Class, Newton Kennel Club, August 23, 2012 under Judge Rafael Malo Alrudo and handled by Jen Leitao. Winners Dog from Open Black Class, Tioga Kennel Club, August 18, 2012 under Judge Ms. Elizabeth Muthard and handled by Jen Leitao. Winners Dog and Best of Winners from Open Black Class, Susque-Nango Kennel Club, August 17, 2012 under Judge Sharon Lyons and handled by Jen Leitao. Winners Dog from Open Black Class, Del-Otse-Nango Kennel Club, June 29, 2012 under Judge Ms. M. Martorella and handled by Jen Leitao. Winners Dog from Open Black Class, Kanadasaga Kennel Club, June 28, 2012 under Judge Mr. D. J. Murphy and handled by Jen Leitao. 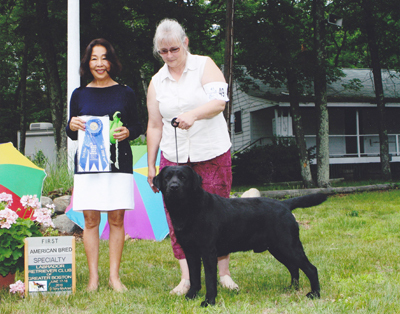 Second Place in Open Black Class, Labrador Retreiver Club of Greater Boston Specialty, June 15, 2012 under breeder Judge Mrs. Sherry Anderson (Sher-mi) and handled by Jen Leitao. 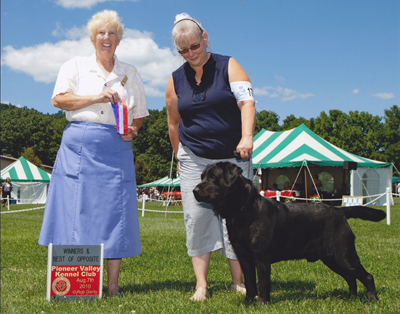 Second Place in Open Black Class, Labrador Retreiver Club of Greater Boston Specialty, June 14, 2012 under breeder Judge Mrs. Pierrette McLean (Castlegar) and handled by Jen Leitao. Winners Dog, Best of Winners and Best of Breed from Open Black Class, New Castle Kennel Club, March 26, 2012 under Judge Elizabeth Muthard and handled by Jen Leitao. Winners Dog and Best of Breed from AmBred Class, Rhode Island Kennel Club, April 15, 2012 under Judge Mr. Norman Kenney and handled by Jen Leitao. Reserve Winners Dog from AmBred Class, Rhode Island Kennel Club, April 14, 2012 under Judge Mr. Frank J. Washabaugh and handled by Jen Leitao. 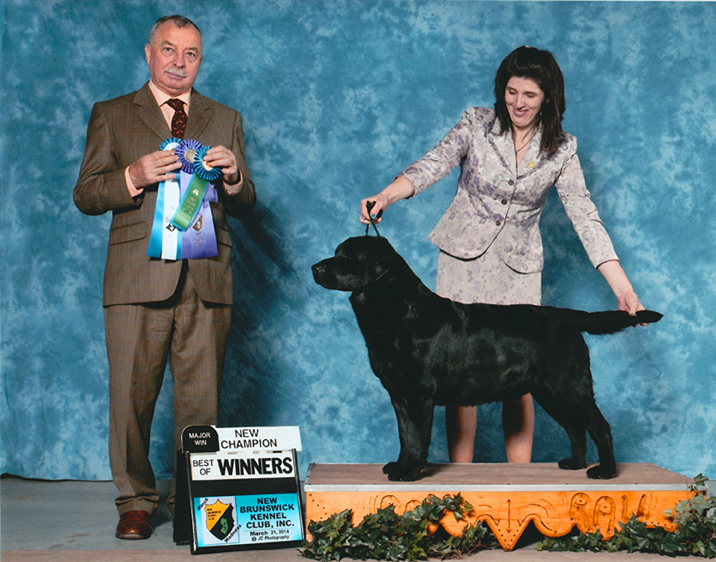 First Place in Open Black Class, Labrador Retriever Club of the Potomac Specialty, April 11-13, 2012 under breeder Judge Mr. Richard L. Edwards (Lasgarn) and handled by Jen Leitao. Critique: I really liked good black of excellent type and breed character. I liked his balance, his construction and he showed and moved well. He is masculine but not coarse in any way. 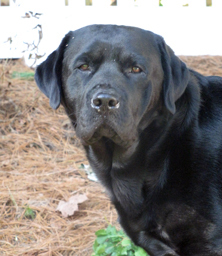 He is a very good one beaten later by dogs with better expressions, a thoroughly nice Lab. First Place in Open Black Class, New England Sporting Group Association, March 18, 2012 under breeder Judge Ms. Margaret Brown (Ramsayville) and handled by Jen Leitao. Reserve Winners Dog from Open Black Class, Elm City Kennel Club, February 18, 2012 under Judge Mr. Norman Kenney and handled by Jen Leitao. 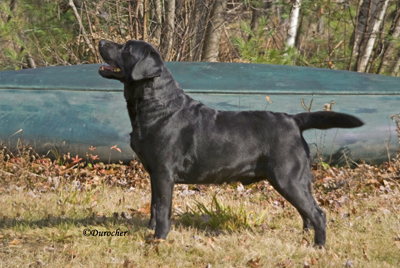 Reserve Winners Dog from Bred By Exhibitor Class, Pawcatuck River Labrador Retriever Club Specialty, September 22, 2011 under Breeder Judge Mr. David Hopkinson (Rocheby). 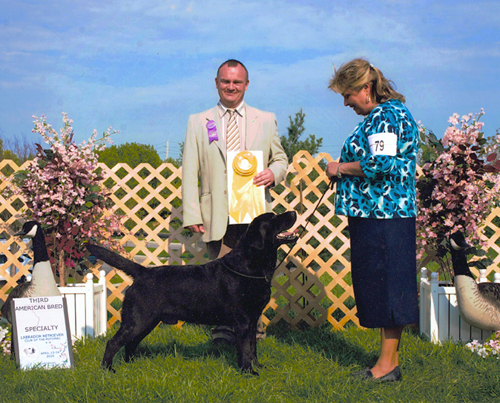 Fourth Place in Am-Bred Black Dogs Class, Labrador Retriever Club of the Potomac Specialty, April 13, 2011 under breeder Judge Mrs. Gunilla Ek (Attikonak) and handled by Karen Day. Critique: Another lovely boy with excellent topline and tailset. Well angulated upper arm into good shoulder placement. To be critical would like a better stifle. Excellent coat. Second Place in Bred By Exhibitor Class, New England Sporting Group Association, March 19, 2010 under breeder Judge Dr. Elizabeth Wenner (Surry). 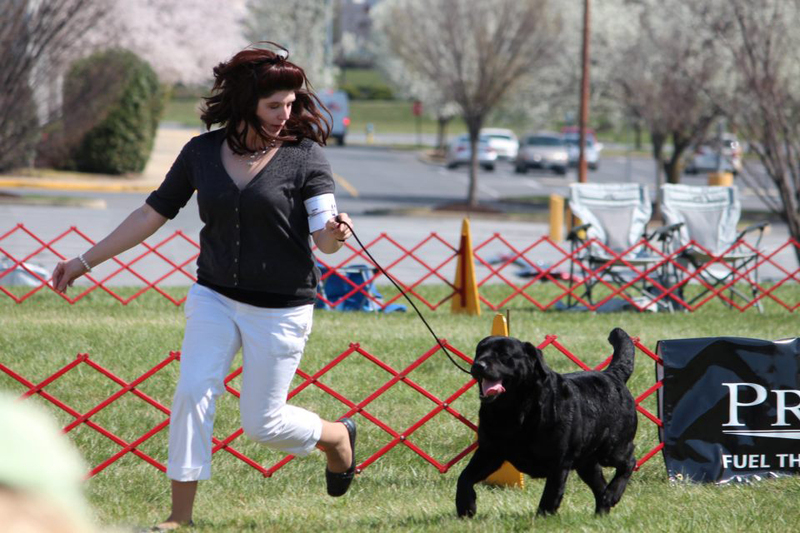 Third Place in Am-Bred Black Dogs Class, Labrador Retriever Club of the Potomac Specialty, April 13, 2010 under breeder Judge Mr. Philippe Lammens (Misty Dreams) and handled by Karen Day. 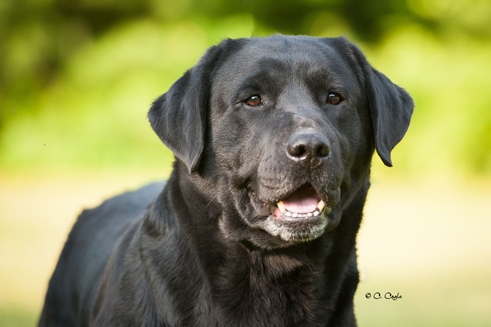 Critique: What a nice dog, not as heavy as the 2 first but full of qualities, very nice head & expression, super neck, top line and tail set, very well angulated in front and back, good mover, a real champion quality dog. * Owner Handled unless otherwise noted. 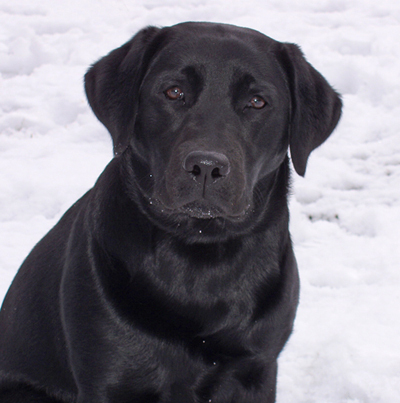 River is retired from our breeding program.